I’d like to introduce the final six book blogging superstars who will take part in The Good Teacher blog tour. I’m so grateful to all the book bloggers who have generously given their free time to read, review and/or post about my detective mystery. Mum of three Liz of Liz Loves Books will have a go at most types of fiction, her favourites being the entire works of Stephen King, crime fiction, young adult, post-apocalyptic stories, urban fantasy and science fiction. Recently she’s found herself enjoying literary fiction and chick lit. She is a freelance submissions reader for Orenda books and an editor at Manatee Books Ltd.
Linda’s Book Bag is an award-winning blog. This year it was named #BloggersBash Best Overall Blog and was Best Book Review Blog in 2016. In 2017 Linda received the Media Star Award from the Romantic Novelists’ Association. When Linda’s not reading, she can be found gardening, travelling and/or drinking tea. Linda often gets invited to publishers’ showcases, and her follow-up posts give the exciting lowdown on forthcoming titles. Lou on Reader’s Retreat loves crime fiction in all its sub-genres and is a big fan of technothrillers where social media, internet dating, chatrooms and the like add an extra fear factor to the mystery. She also likes fantasy, sci-fi, and some literary fiction, but she’ll try out other genres, too, such as poetry, history and books from a variety of countries and cultures. Lou is a librarian on Good Reads. One of the great things about book blogging is that you can connect internationally. 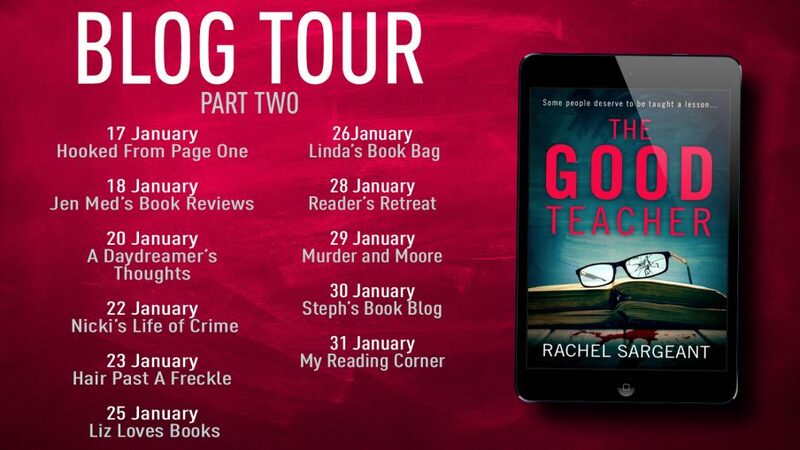 I’m delighted that my blog tour for The Good Teacher will make a stop in Pennsylvania, USA when I visit Murder and Moore. With a blog name like that, it’s hardly surprising Christen’s interests are all things crime – crime fiction, true crime, thrillers, suspense, and psychological thrillers, not only in books but also in TV shows and podcasts that have a criminal element at the core. Steph of Steph’s Book Blog likes all kinds of crime fiction, including psychological thrillers. She also enjoys historical fiction, contemporary fiction, fantasy novels and translated fiction. As well as book blogging, Steph likes walking, bird watching and genealogy. Future blogs are likely to include Steph’s photographs of historic buildings as she combines her interests in local history and photography. My Reading Corner provided the final stop on the blog tour for The Perfect Neighbours last year and I’m pleased to say is doing the same again this year for The Good Teacher. Karen puts her long train commute to good use by reading. Her favourite genres are mystery, thriller, psychological suspense, women’s contemporary fiction, post 1700 historical novels and timeslips. She is a member of the LoveReading review panel and also the Romantic Novelists’ Association reader panel. Read about all the other book blogging superstars on my blog tour here and here.